As you are all no doubt aware, this month, Temple Beth Am begins construction on a new sanctuary and new school building, which are exciting developments in the life of our synagogue. Last fall, our previous Rosh, Sandra Lepson, along with Miriam Prum Hess and Joel Grossman, met with Rabbi Kligfeld and the senior TBA team to work out a process for allocating the space in TBA to ensure that all three minyanim that meet weekly would have davening space. The arrangement provides that the Library Minyan will daven regularly in the Dorff Nelson Chapel, unless there is a bar or bat mitzvah that would ordinarily take place in Shir Hadash (main sanctuary) and the family has requested the Dorff Nelson Chapel. On those Shabbatot, the Library Minyan will daven in another space in TBA, most likely Adelson Hall. Several weeks ago, I met with Rabbi Chorny and Sheryl Goldman to review the upcoming schedule. Through the month of May, the Library Minyan will daven in the Dorff Nelson Chapel. On the Shabbatot of June 2, 9 and 16, the b'nai mitzvah families have requested the Dorff Nelson, so the Library Minyan will daven in Adelson. On June 23 and June 30, the Library Minyan will daven in the Dorff Nelson, with b'not mitvah each Shabbat. On July 7, the Library Minyan will daven in Adelson. For the remainder of July and through and including August 18, the Library Minyan will daven in the Dorff Nelson Chapel. I will keep you posted on other dates as we move toward the end of the summer. Please be aware that as we learn of relevant information about davening location, it will be added to the Library Minyan calendar on the libraryminyan.org website, thanks to our webmaster, Bob Roosth. On the weeks that the Library Minyan davens in Adelson, we will move downstairs to Hersch Hall for kiddush, while the bar or bat mitzvah family and guests will move from the Dorff Nelson Chapel upstairs to the ballroom for kiddush. This promises to pose some challenging logistics, but I am confident we can handle it!! Later this month, we will observe Shavuot, with a Library Minyan organized service that will include Shir Hadash (and Beitenu) on the first day (Sunday May 20) and with the Library Minyan and Shir Hadash each having its own service on the second day (Monday May 21). The Library Minyan will daven in the Dorff Nelson Chapel on the second day. On June 2, the Library Minyan will celebrate the graduation of TBA 8th and 12th graders! Janet Weissman and I are coordinating the graduates' participation in the service and a festive kiddush following services. Today my friend Molly and I went to the Walk To End Genocide with Temple Beth Am. There were a lot of Beth Am members participating — maybe 25 — and about 75 different teams from temples and groups around Los Angeles. 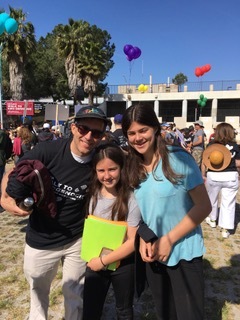 The Walk is put on by Jewish World Watch to raise awareness of the genocides going around the world. Some places include South Sudan, Syria, and Congo, as well as Darfuri and Rohingya refugees. The main event was a 2-mile walk starting from Pan Pacific Park. Before the walk, people spoke about the different problems and why it is important to help. There were also booths with information about the conflicts. It was really moving seeing everyone walking together. This wasn’t my first time walking, but I think this was my first time really understanding what it meant. I used to do it because that was what my family did. Now, because I am learning about the crisis in Syria, I really understand why we march. Most people don’t know about these genocides because they aren’t happening in America, so nobody knows what is happening and how dire it is. By marching we raise awareness, and let people know that they should help. People helped by donating money and collecting donations from others. The money raised lets Jewish World Watch publicize and do relief projects to help communities that are in need. This wasn’t my first year walking and it definitely won’t be my last. The Diaspora Potluck Committee (DPL) invites you to a BYOL (Bring Your Own Lunch) community picnic on the second day of Shavuot, Monday, May 21, in La Cienega Park. Come share your favorite cheesecake (or other dairy/pareve dessert) and enjoy the fresh air together. There will be childcare available for kids under 12. Please let us know if you are going to be needing childcare. We look forward to seeing you there! Sincerely, the co-chairs of the DPL committee, Deborah Blum (deborahblum12@gmail.com) & Michelle Wolf (michellekwolfla@gmail.com). Kudos to Essia Cartoon Fredman for arranging home hospitality for Pesach. Ten Library Minyan families opened their homes to guests at their seders. Thanks to all who participated.